Grabfast is a high-performance, fast-tacking, industrial contact adhesive. Although it was initially designed for bonding decorative laminates to particle board it is now used on a wide variety of substrates including veneers, wood, plastics, fibreglass, rubber, polythene, acrylic, metal, fabric, upholstery and a whole host of other materials. All you need to get you spraying is a gun, hose, glue canister and roller to give you a permanent high strength bond in minutes. Available in disposable (17kg) or refillable (85kg) canisters. The initial grab is so good that the substrates that have been bonded can be handled and machined almost immediately. This allows the work piece to be completed without any down time which is crucial in a busy working environment. The nature of the spray system means that it is maintenance free, clean and cost effective, as compared to normal hand-applied contact adhesive. No more trowelling on of adhesive and waiting for it to go off. Spray both substrates, wait just a few minutes for the adhesive to tack up, and bring them together using a roller to form a permanent bond. 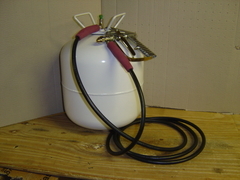 Connect the gun to the canister using the hose and ensure all connections are tight. Finger tight is not secure enough. Hold the gun parallel to the work surface and apply a generous coat. Wait for the adhesive to tack up i.e. to be dry to the touch without any transference to the fingers. It is important to remember that Grabfast is a contact adhesive and forms its bond by sticking to itself. Hence there must be enough adhesive on both substrates to allow this to happen. Coverage of 80 to 100% is recommended. If it is possible and practical, the ideal procedure is to spray one surface vertically and the other horizontally. On porous surfaces and edge banding a double coat of adhesive is advised. Ensure the first coat has dried before applying the second. Grabfast should not be allowed to puddle or concentrate in any one area. Grabfast is a pressure-sensitive adhesive so uniform pressure of 50-70lbs should be applied after the two surfaces have been brought together. A hand held pressure roller is ideal for obtaining the strongest bond. Ideally all substrates to be bonded should be preconditioned prior to use. They should be clean, dry, and grease and dust free. Laminates especially should be stored at approximately 20°C with relative humidity of 45-55% for 48 hours before bonding. Air should be allowed to flow freely around the components. Grabfast dries in 2 minutes under normal conditions. High humidity and low temperature will slow the drying time. If the temperature gets too low bloom can occur. This is where moisture forms on the glue line and blisters may start to appear over time. Never bring the two surfaces together prematurely as solvent will be trapped causing bubbles. Although the adhesive bonds a wide range of substrates please test in an inconspicuous area first.